What is furikake? Furikake, or furikake seasoning, refers to a range of dried, normally mixed seasonings made especially for sprinkling on top of rice. As a unique type of Japanese seasoning furikake comes in a wide range of flavours, including wasabi furikake (with dried wasabi as a main ingredient), nori komi furikake (containing tiny pieces of seasoned nori seaweed), shiso furikake (made from seasoned, dried, and crushed red perilla leaves), and salmon furikake (with dried salmon crumbs). Furikake may also contain dried omelette pieces, roasted sesame seeds, bonito fish flakes, and even matcha green tea on occasion. Find out more about Japanese furikake seasoning by reading on, and if you would like to buy furikake and try it for yourself, be sure to take a look at japancentre.com’s Rice Seasoning section. Furikake rice seasoning is also a common feature in a bento lunch box, either already sprinkled onto the bed of rice that makes up a large part of most bento lunches, or kept in a separate little furikake shaker for the bento eater to sprinkle on themselves. Rice seasoning furikake is versatile, and furikake recipes such as furikake chex mix and furikake salmon are becoming increasingly popular not just with Japanese cooks, but among cooking enthusiasts all over the world. A refreshing, herby variety of furikake, shiso furikake (commonly referred to by the brand name ‘Yukari’, which was originally coined by Mishima Foods Co.) is made of seasoned, dried red shiso (or perilla) leaves. Known for its distinct red/purple colour as well as its flavour, shiso is often used as an outer covering for sushi rolls and onigiri rice balls. Perfect for those who love a little fire, wasabi furikake is usually made from a combination of dried wasabi and/or horseradish, seasoned nori seaweed pieces, whole sesame seeds, and other Japanese seasonings. Try on rice, use to season a steamed piece of fish, or combine with rice and green tea for a hot chazuke soup. One bite of rice topped with this seriously savoury furikake, and you will never want to eat rice without it again. Made with nori seaweed flakes, powdered egg granules, whole sesame seeds, bonito fish flakes and other seasonings, this furikake adds incredible amounts of savoury umami flavour to any food it touches. Try it on rice and other plain staple foods such as toast, tofu, and spaghetti. Made from dried salmon flakes and often containing nori seaweed pieces or spring greens, salmon furikake gives food a pleasant savoury/salty flavour. 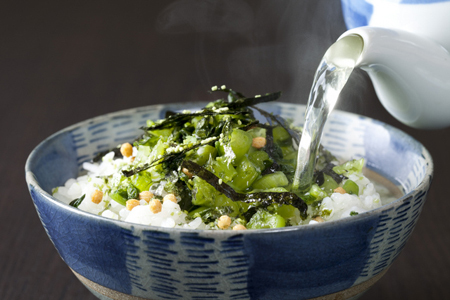 As well as being nice on rice, it is also particularly tasty when used to make green tea chazuke soup, with the refreshing tea flavour nicely offsetting the saltiness of the salmon. How Do You Want to Use It? Furikake can also be used to flavour rice-based snacks such as sushi rolls and onigiri rice balls. 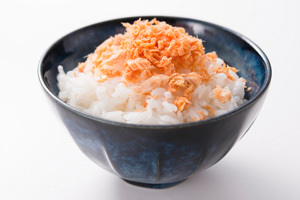 Try mixing furikake into plain rice or sushi rice, then making your sushi rolls or onigiri rice balls as normal. Alternatively, when you have finished shaping your rice-based snack, roll it in furikake for a tasty savoury outer coating. Rice is not the only food staple that can benefit from a touch of furikake. Try sprinkling a little salmon or nori tamago furikake on freshly cooked pasta. Like Japonica rice, pasta is slightly sticky, especially when freshly cooked, so the furikake will stick to it and make a serving of plain pasta into a great-tasting snack or light meal. Instead of just adding salt or butter to popcorn, why not try something a little different and flavour your popcorn with furikake? Simply open up a bag of freshly microwaved popcorn, shake in your desired amount of furikake, close the bag back up, and shake well to mix the furikake in. The word ‘furikake’ literally means ‘sprinkle over’. As such, the most well-known and accepted way of using furikake is to tear open a sachet and sprinkle it over a serving of rice, whether that be hot, steamed rice fresh from the rice cooker/saucepan, cold rice from the night before, or rice that is going into a bento box for lunch. Chazuke rice soup, or ochazuke, is one simple Japanese dish that is guaranteed to take anybody from Japan straight back to their childhood. This comfort food consists of a bowl of rice topped with various savoury toppings/seasonings, with green tea, hot water, or a light dashi soup stock poured over the top (similarly to how milk is poured over cereal). Chazuke is seen as a quick fix dish, because it is easily prepared, a great way to use up leftover rice, as well as being both filling enough to keep away hunger between meals and hot enough to warm a person up. Chazuke is also easily customisable, and it can be garnished with whatever savoury topping is available or desired. Popular toppings include salted salmon, wasabi, nori seaweed, sesame seeds, tsukemono pickles, and any type of furikake rice seasoning. As well as furikake being useful for making chazuke, there are also special ‘instant chazuke’ furikake rice seasonings available, where the furikake is mixed with green tea or matcha powder that dissolves when boiling water is added. To use, simply sprinkle one sachet over a serving of cooked white rice and add boiling water. If you fancy a bowl of chazuke rice soup with minimum effort necessary, be sure to take a look at japancentre.com’s range of instant chazuke. Want to Know About Sticky Rice? 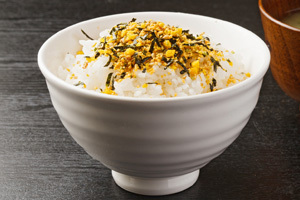 When sprinkling furikake onto rice, be sure that the rice you are using is Japanese. All Japanese rice, known as Japonica, has the unique quality of becoming sticky when it is cooked. 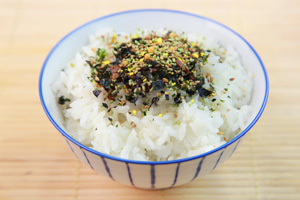 When furikake is sprinkled onto Japanese rice, the furikake sticks to the rice and will not fall off as it is eaten. Take a look at japancentre.com’s range of Japanese rice to find the perfect rice for your furikake. As the dietary staple of Japan, knowing how to cook Japanese rice is an important first step to becoming a Japanese cooking master. Perfectly prepared Japanese rice should be light, fluffy, and slightly sticky when cooked, and this popular Japan Centre recipe will have you making sublime rice every time. Check our recipe and learn how to cook delicious rice. Since developing their first furikake products, ‘Ryoko no Tomo’ (‘Holiday Companion’) in 1916, Tanaka Foods has been determined to bring the best quality furikake to Japan and around the world. As well as keeping up to date with their customers’ changing social needs and desires, they also produce their furikake with care, affection, and authentic ingredients, to ensure that their products can be eaten and enjoyed at any time. Since setting up shop in 1949, family-owned dried seasoning manufacturer Mishima has become one of the biggest furikake brands in Japan. 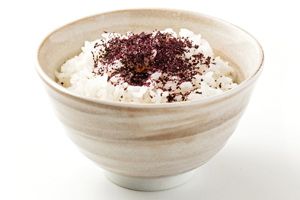 Their most well-known product by far is Yukari; the distinct purple/red furikake made from seasoned, dried, red shiso (perilla) leaves. As well as Yukari, Mishima also produce a variety of other furikake and dried seasonings, all made with the utmost care from authentic ingredients. … such a simple statement, but an important aspect of life for over half of the world’s population who eat rice everyday!With a healthy amount of vitamin B, fibre and protein, rice gives you energy quickly and due to it being an easily digestible food, it is easy to see why such a large percentage of the world relies on this super grain.